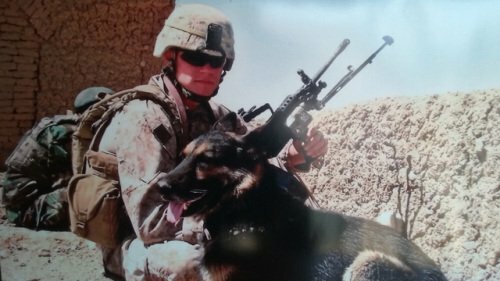 Last month marked the passing of a beloved war dog named Rico. In Saugatuck, Michigan, the Beckley family said goodbye to their beloved pet and protector in a military funeral fit for the hero that he was. It was complete with all the trappings: the playing of Taps, a 21-gun salute and a flag-draped coffin. In Southern Afghanistan, the German Shepherd had the job of re-establishing contact with the enemy. In 2011, he was treated for injuries received in combat. (See my article on Lucca: A Military Dog For All Seasons.) After his retirement, he came to live with Tammy and Russell Beckley, Sr. while their 27 year-old son continued to serve. "If I were going to add one thing about Rico, it would be his undivided loyalty. Every move I made was with Rico by my side. There could be 10 people in our home and he didn't care about anyone but me. I was always honored by that and miss him so incredibly much." Rico received multiple medical treatments during the last two years of his life, but his health continued to deteriorate. The time came for a heart-breaking decision followed by a military send-ff fit for a military hero. A local news station covered the service, which was held in the Beckley home and attended by friends and neighbors in the community. Even the younger Beckley arranged for a leave of absence and traveled home to Michigan for just 40 hours so that he could attend the special ceremony honoring his beloved companion. Afterwards, the vet administered the injection and the dog's body was carried out in a flag-draped coffin, with another flag draped at half-mast to acknowledge his passing. "Rico was one of the best things that ever happebed to me. We didn't know if 15 or 150 people would show up, but we wanted to honor him for his service to our country and to our family,"
The outpouring of letters and messages of sympathy that the family received from those whom they did not even know has deeply touched them. The elder Beckley is finding it vey difficult to adjust to life without his loyal friend. (See my article on Sergeant Rocky and Offcier Brown.) And too, that added unspoken layer of loyalty and gratitude for the dog who protected his son while on mission in Afghanistan. You are always in our hearts, Rico, for your love, service and loyalty.